Dell WD15 dock NIGHTMARE! Anything can be done? I am posting my first post here... I've reading all posts regarding usb-c dock issues. I have fallen victim too... 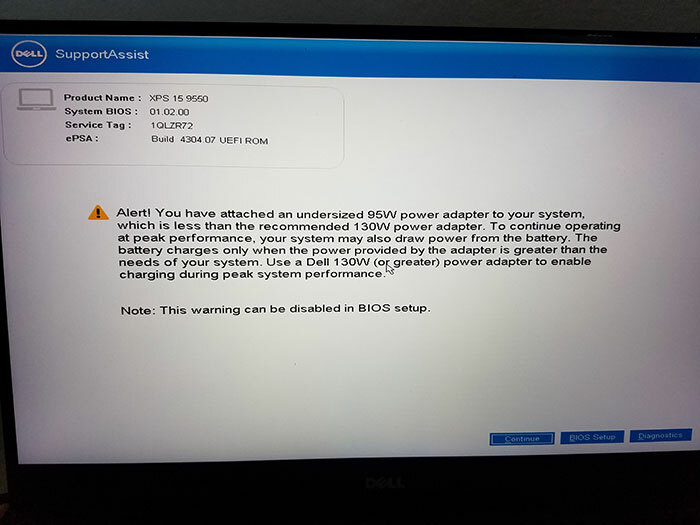 I bought brand new Dell WD15 dock and before begin i install latest drivers and still get under power warning! Please see photo attached! I spent hours with Dell support and they advice me to clean install and install drivers in right order, so wasting almost a day i did all this and problem don't go away! Aside the power warning the display randomly disconnects... leaving me no screen at all (the laptop screen doesn't switch back either) and now laptop gets very hot, making me wonder if i somehow damaged the laptop itself? RE: Dell WD15 dock NIGHTMARE! Anything can be done? I am having the exact same problem. All my drivers and bios updates are installed in the correct order. This dock was sold to me as a recommended accessory when I customized my Precision 7510 before purchase. I will not run my UHDTV at full resolution even though the documentation says that it can. I have had to resort to plugging everything in directly to my laptop & disconnecting my dock. It is a total & utter waste of money. Same issue and THEN some! Really....how difficult is it to get a docking station to do what it's supposed to do?!?!?!? I guess it's time to open another support case with Dell. Exactly how I like to spend my time after spending some serious $$$ on a laptop/docking station configuration.